Once upon a time, moving files from one computer to another via a network was an arduous task that often required delving into the word of the command line. 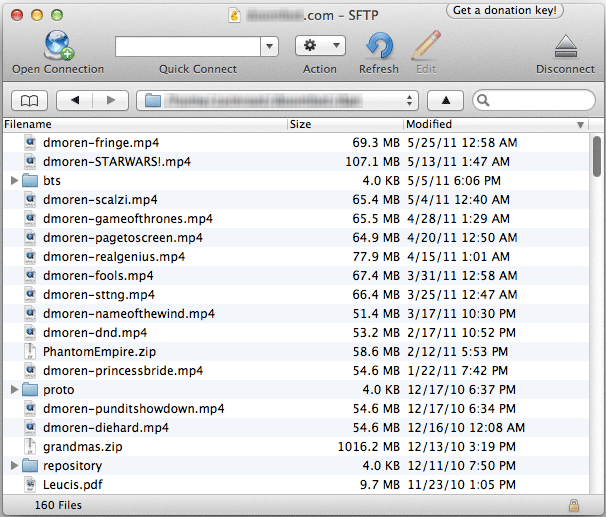 But these days, any number of FTP clients for the Mac make it as easy as interacting with the documents on your own computer. Among them, the open source Cyberduck 4.0.2 is an excellent option: It’s got a friendly interface, compatibility with a wide variety of protocols and a number of useful and powerful features. Cyberduck’s browser window is its main point of interaction. When you start the program, it provides a list of bookmarks for common services, including Google Docs, Amazon S3 and Rackspace. In addition, you can add your own bookmarks to this list, view the history of servers you’ve previously connected to, and even browse for any available local servers via Bonjour. In addition to vanilla FTP, Cyberduck supports a veritable cornucopia of protocols, including FTP-SSL, SFTP (with support for SCP), WebDAV (with HTTP/SSL support), iDisk, Windows Azure Cloud Storage and more. There’s also support for accessing your Dropbox without syncing it to your computer, but currently you need to jump through some technical hoops to set that up. Once you’ve connected to a remote server, browsing it is as easy as navigating your hard drive: Files and folders appear in a list, just as in the Finder. You can double click folders to open them, or click the disclosure triangle to the left to display the contained files in the same window. While downloading a file requires nothing more than a double click, you can also get a preview of a file using Cyberduck’s support for Quick Look, just hit spacebar or pick Quick Look from the contextual menu. You can also directly open files in an external editor of your choice, handy for those who work with remote copies of web pages. And Cyberduck’s built-in search box is a huge boon to anybody who’s ever struggled to find the right file. It filters as you type, showing you the files whose names match your terms. If you’re looking for more advanced options, Cyberduck has plenty of those as well, ranging from support for public key encryption to a variety of text encodings to bandwidth throttling on file transfers. You can also synchronise folders on your local machine with those on the remote server, although that functionality pales somewhat next to the syncing and versioning offered by integrated services like Dropbox. My personal favourite features are the ability to send shell commands, either with the Send Command option, or by using Cyberduck’s Open in Terminal feature, which launches OS X’s Terminal application and (after you enter the remote account’s login password again), drops you right into the directory you were in. Overall, Cyberduck is fast, featureful, and friendly. And though you can use it for free if you download it from the developer’s site, it’s well worth it to donate some money, if only to keep such a great FTP client available to all.